In some respects I found this release somewhat of a surprise. 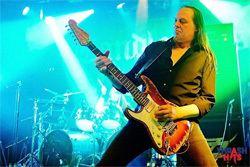 I wouldn't have expected Lars Johansson, lead guitarist for doom metal band Candlemass, to be into classic blues hard rock. Yet these were some of his early influences. So here he is grinding and wailing like it's 1972 with his project Fat.Mo.Mac. Yeah, I know. What's up with the name? Its from Fatmomakke, one of the largest Alps of northern Sweden near the polar circle. Johansson reached out to some fellow musicians and friends for this album. These include vocalist Mats Leven (Candlemass, Yngvie Malmsteen, Therion, et al), guitarist Klas Gunnerfeldt (Psycosomatic Cowboys, Primate Life, Backwood Preachers, et al), bassist Tobbe Moen (Gotham City, Oz, et al), drummer Stefan Gunnarsson (Janne Schaffer, Raj Montana Band, et al). Additionally, guitarist Roger Eklof, who was at the start at the project, but tragically died before completion, is heard on three tracks. I would likely put Johansson's approach to classic blues hard rock in the realm of very early Leslie West, maybe touched a little Stevie Ray Vaughn, even some Pat Travers. But, overall, his approach is heavier, certainly not as lively as Travers can be (though Gear Shifter comes close). They're heavy, sharp, even some what ham-fisted as the riffs some both rough and tough, like grinding out both meat and bone. There's groove underneath, even some of the natural smokiness of classic blues. But this ain't Muddy Waters or B.B. King. There's not a whole lot of subtly to his approach. The calmest songs, if you can call them that, may be Get Home, quite laid back, and Memories Is All There Is, a real thick, slow, and grinding number. Another observation of note: to my knowledge, I don't think I've ever heard Mats Leven sing in this style. I'm not saying he hasn't before. But he adds a whole new level grittiness and soul to the Fat.Mo.Mac sound. At first, I thought it contrived, but his focus and voice fits the music. Then, a final thought: the more I listen to these tunes, I'm thinking Johansson's approach, while traditional, seems to have a real American feeling, born somewhere out Texas maybe. Maybe that's a compliment. Otherwise, for some working man's gritty and grinding blues hard rock, Lars Johansson and his Fat.Mo.Mac project is the real deal. For some working man's gritty and grinding blues hard rock, Lars Johansson and his Fat.Mo.Mac project is the real deal.